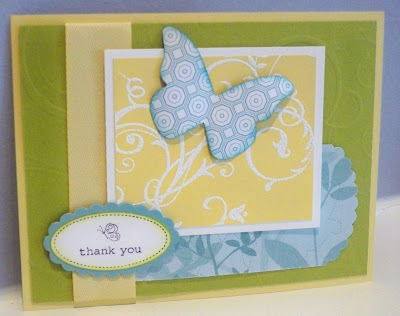 Trinity Designs: Butterflies are Beautiful! Hi everyone! I'm baaack! And boy it feels good to be back in the studio with no jet lag, no sickness and itching to stamp! Thanks so much for being patient with me as I got back to normal last week. Our trip to Hawaii was simply put, amazing, and was just what Mark and I needed. But, re-entry was pretty crazy. I came home sick, Emma was sick, we had our final rehearsals for the church Easter Drama and then the 3 performances over the weekend AND Emma got sick again! Whew! Can I just go back to Hawaii? Please?! No? Oh well, I'll just have to post some pictures here this week so you can share my memories. The card today is actually one of two swap cards that I made with items from the new Occasions Mini Catalog. The swap was due in the mail on Friday, but I didn't get them finished until yesterday and since I was late, I had to make two cards for each player. I'll show you that one later this week. I took my color scheme from the new Walk in the Park Designer Series Paper. The cardbase is So Saffron, layered with Kiwi Kiss which has been dry embossed with my Texturz Plates in my Big Shot machine. I love these subtle backgrounds! The next layer is actually a piece of the Walk in the Park paper which I ran all the way through my NEW Scalloped Oval Punch and created the scalloped edge. Layered on top of this is Whisper White and So Saffron which has been stamped with the swirl from Baroque Motifs (a classic stamp set! If you don't own this one, you NEED it! Trust me!) I stamped in Whisper White craft ink and heat embossed with my Heat Tool and White Embossing Powder. The ribbon on the left is the So Saffron Twill from the current Idea Book and Catalog. It's actually the first time I've used that ribbon, but it won't be my last. I love it's width and feel. For the Butterfly, I went back to my Big Shot Machine and cut these with more Walk in the Park paper ( actually the reverse of the piece I used at the bottom) and my Stampin' Up! Exclusive Beautiful Butterflies die. I sponged the edges with Baja Breeze ink and curled the wings with my Bone Folder. It's mounted on Stampin' Dimensionals and placed on the white stamped 'vine'. Lastly, the sentiment is stamped with the NEW Only Oval stamp set in Basic Black ink. It's punched out with the Large Oval Punch, sponged with Kiwi Kiss ink and layered on a piece of Baja Breeze cardstock which was punched out with the NEW Scalloped Oval Punch. It too is mounted on dimensionals. So, if you are in this swap, you've now seen card #1 - hope you like it! They all went out in the mail today! LOVE IT! Cannot wait to get it in the mail!! Lucky me! I'm glad your back and feeling better! I owe you one more swap because I was GOING to hand deliver yours....and then time got away from me so I just mailed it yesterday! ;O) IOU! Sending hugs your way!